The Consumer Product Safety Commission is still investigating the root cause of several reported hoverboard fires. Charging up your hoverboard? Keep a fire extinguisher near by. That’s one piece of advice from the US Consumer Product Safety Commission in an update Wednesday to its investigation of the self-balancing boards. It also suggests wearing protective gear, staying off roads and charging the boards away from combustible materials. The federal regulatory agency is now investigating 39 hoverboard fires across 19 states, said CPSC spokesman Scott Wolfson, up from 12 incidents reported in December. The CPSC is focused specifically on the lithium-ion batteries that power the boards and “their interaction with the circuit boards inside the units,” according to statement from CPSC Chairman Elliot F. Kaye. The agency is also expanding its investigation into falls caused by hoverboards due to an “increasing number” of serious injuries and emergency room visits. “We are looking deeper into the design of these products to see if they present a hidden hazard that is leading to fall injuries that should not occur,” Kaye said. Hoverboard enthusiasts will want to pay attention to the ongoing investigation. The agency could push for more voluntary standards or ban hoverboards altogether. The CPSC said it’s moving as quickly as possible but did not give a specific time line. Hoverboards, which can cost anywhere from $200 to $1,500, became a hot item after celebrities like Justin Bieber and Kendall Jenner posted shots of themselves zipping around (and falling off) the boards. Carolina Panthers quarterback Cam Newton is even said to regularly ride one to and from practice. In case you missed the craze, the boards don’t actually hover. The CPSC began investigating hoverboards last month as reports of them catching fire or exploding started to roll in. At the time, the agency said it had received “dozens” of reports of injuries from falls. The hoverboard fires have started in all sorts of different circumstances, according to owners and witnesses. Some of the hoverboards reportedly exploded while charging, others while riding and one while it was simply sitting near a kiosk in a Washington shopping mall. 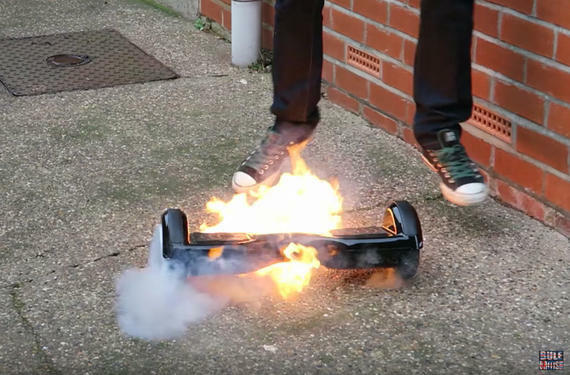 There have been reports of hoverboard fires in the UK, Australia and at least one in Hong Kong. Several US airlines banned hoverboards on passenger flights last month, and the US Postal Service stopped shipping hoverboards by air. Amazon and Target both temporarily suspended sales, and Overstock.com stopped selling hoverboards all together. The CPSC on Wednesday praised Amazon for letting customers return hoverboards for a full refund and encouraged other retailers and manufactures to take similar steps. CNET’s Sean Hollister contributed to this report.